Wang Xuming, Huang Meihui, Cui Buyun. Wang Xuming, Huang Meihui, Cui Buyun. Analysis on brucellosis epidemiological characteristics in Hainan province[J]. Chinese Journal of Epidemiology, 2019, 40(3): 350-353. Abstract: Objective To understand the epidemiological characteristics of brucellosis in Hainan province. Methods Automatic microbial identification system of Vitek 2 compact was used for the preliminary identification of 16 brucellosis cases in Hainan province from 2012 to 2017, and further confirmation was performed with traditional biological typing methods. The epidemiological and clinical characteristics of the patients were analyzed in combination with the results of serological and etiological tests for raised livestock. Results Vitek 2 compact detection results showed that 12 strains were Brucella (B.) melitensis and 4 strains were Ochrobactrum anthropi. Traditional biological typing methods showed that 11 strains were B. melitensis biovar 3 and 5 strains were B. suis biovar 3. 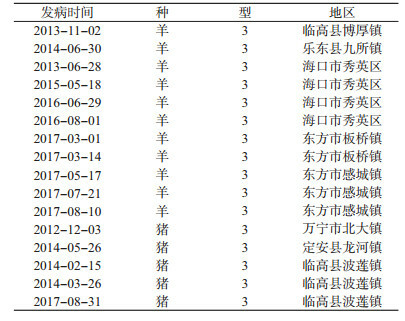 Sixteen cases were found in Dongfang, Lingao, Haikou, Wanning, Ledong and Ding'an with 1 case in 2012, 2 cases in 2013, 4 cases in 2014, 1 case in 2015, 2 cases in 2016 and 6 cases in 2017 respectively. At the same time, 745 sheep serum samples from the epidemic area (Dongfang) were collected for Brucella serum antibody detection, in which 47 were positive (6.3%). And B. melitensis biovar 3 was isolated from samples collected from sick sheep in Dongfang. Conclusions Vitek 2 compact is an simple and convenient method for Brucella identification, but it cannot replace traditional biological typing methods yet. The major epidemic strains of Brucella in Hainan were B. melitensis biovar 3 and B. suis biovar 3. The epidemic of brucellosis in Dongfang in 2017 indicated that brucellosis had spread from animal to human in Hainan, and it is very important to strengthen the prevention and control of brucellosis in Hainan. 翁勇, 闫秀娟. 四例布鲁氏菌病流行特征分析[J]. 海南医学, 2013, 24(17): 2626-2627. 陈海, 李春辉, 朱兰兰, 等. 感染性心内膜炎患者血液中分离到羊种布鲁菌[J]. 中国人兽共患病学报, 2010, 26(3): 289-291. 中华人民共和国卫生部. WS 269-2007布鲁氏菌病诊断标准[S].北京: 人民卫生出版社, 2007. Ministry of Health of the People's Republic of China. WS 269-2007 Diagnostic criteria for brucellosis[S]. Beijing: People's Medical Publishing House, 2007. 陈东科, 陈丽, 许宏涛. 柯氏染色法快速鉴别布鲁菌的方法学探讨[J]. 临床检验杂志, 2015, 33(11): 805-807. 中华人民共和国卫生部疾病预防控制局. 布鲁氏菌病防治手册[M]. 北京: 人民卫生出版社, 2008: 19-29. Disease Prevention and Control Bureau of the Ministry of Health of the People's Republic of China. Brucellosis control manual[M]. Beijing: People's Medical Publishing House, 2008: 19-29. 徐卫民, 王衡, 施世锋, 等. 浙江1例实验室感染布鲁氏菌病病例及其警示[J]. 中国地方病防治杂志, 2010, 25(1): 58. Xu WM, Wang H, Shi SF, et al. A case of brucellosis infected in a laboratory in Zhejiang province and its warning[J]. Chin J Ctrl Endem Dis, 2010, 25(1): 58. 肖春霞, 赵鸿雁, 崔步云, 等. 全自动微生物分析系统对布鲁杆菌属和种鉴定效果的研究[J]. 中华地方病学杂志, 2015, 34(6): 416-420.